20ga. Schrifle NeoTec series: NeoTec Copper (green) slug. “The first, RIFLE DESIGN, ammo for use in any make 20ga SLUG GUN with a rifled barrel”! 10 Round Box. Current loading: 260gr Raptor Hollow Point, NON-Sabot, 2075fps. 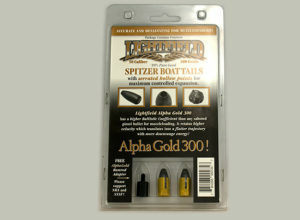 Recommended for barrels with a 1-23 or 1-24 twist rates. The 10-round box of the new 20 ga Schrifle NeoTec series (green/non lead): all Copper 365gr slug is $50.00 due to the cost of pure copper material. From Oct 1, for as long as they last, TarHunt is releasing a 6-round writer/sample box in the following (lead core) slug weights: the 26ogr Raptor Alv, 270gr Raptor Alv. 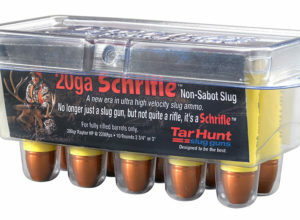 And a 6-round writer/sample box of the new 20ga Schrifle NeoTec series: all Copper 365gr slug. 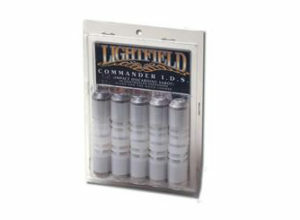 The Schrifle Raptor series: Alv/lead slug 6-round sample boxes are $28.50 plus shipping. The 20ga Schrifle series- NeoTec (green slug): an all Copper 365gr 6-round box is $32.50 plus shipping. Watch for another NeoTec Copper slug around 300 grains in the near future. All new 20ga Schrifle NeoTec Copper 365gr @1800fps. 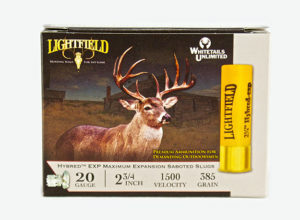 Our heaviest, flattest shooting, excellent expansion as well as great weight retention slug. To find out more about the all new NeoTec Copper slug, from TarHunt, on the home page by clicking on the RED (learn more) tab on the home page. NOTE: The 20ga Schrifle NeoTec Copper (non lead) 365gr (62 caliber) slug will stabilize in all known 20 gauge twist rates as long as the barrel bore diameter is with in SAAMI specification. Velocity-1800fps. Retained weight-as much as 83% or 302gr. Half dollar size expansion! The “20ga Schrifle” non-sabot round, typically produces 12% less serious flyers than any other current sabot-discarding production round. The 20ga “Schrifle” WILL NOT work well when used in the H&R 960 slug gun with it’s 1-35 twist and it’s .007th “oversize bore”. I am not allowed to produce a 20ga Schrifle round for the H&R 960-20ga because the round could be fired in a normal size (smaller) bore! 10 rounds per box, 6-round sample box, our normal UPS shipping day is Wednesday. 20ga. Schrifle Raptor series: The Raptor Alv, non-sabot is NOT a lead free slug.